Kyle Cornforth was up for a challenge. 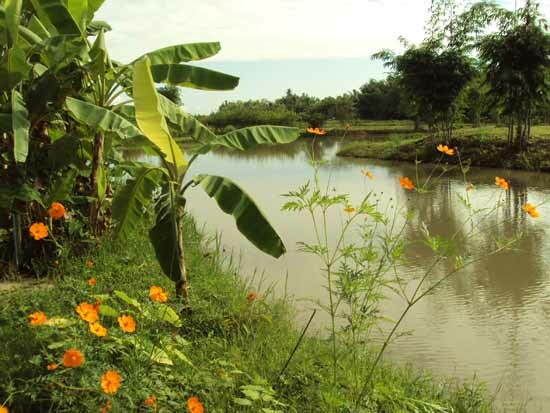 So when the founder of a cooking school in the outskirts of Chiang Mai asked Kyle, who was working at the Edible Schoolyard at the time, if she’d like to come on board as director of The Prem Organic Cooking Academy and Farm, she leapt at the chance. 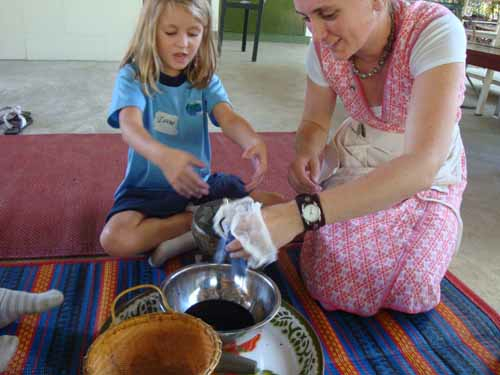 She wanted to share what she’d learned about local, sustainable, organic cooking at a public school in north Berkeley with students and staff at an international school in northern Thailand. So last summer, Kyle and her husband Jay, a teacher at Martin Luther King, Jr. Middle School in Berkeley where Edible is based (the two actually met in the garden, cue a chorus of awws), packed their bags and headed off on an adventure in Asia with their daughter Zorah. That’s proven to be the case. Going to live in another continent sounds super cool. And, for the most part, it is. Kyle loves the liveliness, colors, sounds, smells, sights, and tastes of Thailand. She even loves that simply getting into town, about 45 minutes away, is its own adventure. But as anyone who has ever done it will tell you, moving out of your comfort zone, setting up shop in another country, and navigating an unfamiliar culture is not without its challenges. Even something as seemingly banal as the weather can take time to get used to. Kyle finds the heat and humidity in Chiang Mai tough after the temperate, foggy Bay Area. A soft-spoken woman with a kind demeanor, Kyle finds it incongruous that at times she feels like the loud, brash, opinionated American. Her gentle but direct manner and problem-solving approach doesn’t always serve her well here — it can offend — and so she’s figured out how to communicate to better suit local tastes. The family is thriving in their temporary Thai home. Kyle, 30, describes her daughter and husband as being “Thai in their past lives,” pointing out, as evidence, that they happily eat rice for breakfast. Kyle is learning about the principles behind traditional Thai cooking, with its emphasis on food as medicine. And its key flavors: sweet, salty, buttery, bland, astringent, bitter, spicy, cool, and sour. She says she has adopted a new, favorite way of thinking about meal planning, the Thai concept known as grom grawm or contrast, surprise, and balance. She’s on a personal mission to perfect making Khao Soy, a popular street dish, comprised of crispy egg noodles, pickled cabbage, shallots, lime, meat, curry sauce, and coconut milk. And she is following the advice of a wise friend who encouraged her “to go slow and go deep,” in her new environment. So she makes a point of frequenting the same vendors at local markets or street stalls, developing relationships with these people and their food as she goes. 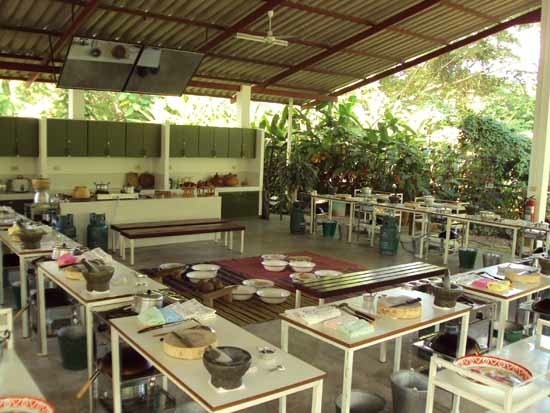 Founded in 2008 by the San Diego restauranteur Su-Mei Yu, the Prem academy teaches traditional Thai cooking and farming techniques to visiting school kids from international schools around the globe. Yu grew up in Bangkok, moved to the U.S. as a teen, and opened the first Thai restaurant in San Diego some 25 years ago. The cookbook author wants to help preserve and pass on the customs she learned as a young child, both in the kitchen and on the land. Yu discovered that children growing up in cities in Thailand — and other Asian nations –often have little knowledge about where food comes from or how to cook, not unlike many American children. Yu is friends with Mom Luang Tridhosyuth Devakul, the founder of the Prem Tinsulanonda International School (known as the Prem Center), who planted a vast organic garden that was so prolific it wasn’t long before the farm was feeding students at the K-12 boarding school. Adding the cooking academy felt like a natural progression. 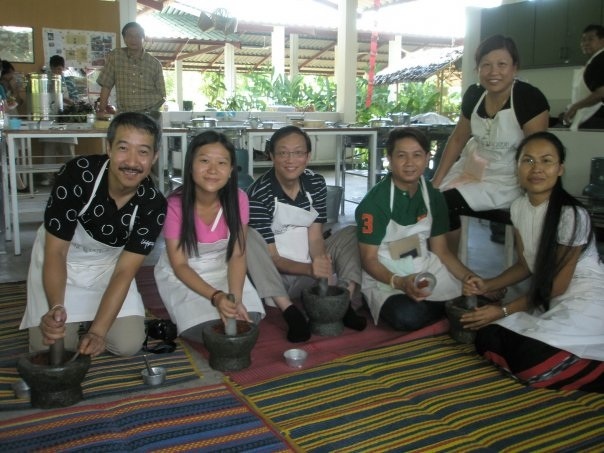 At Prem, students learn how to prepare authentic Thai food using traditional tools. They make coconut milk using a little wooden stool with a sharp blade known as a kratai. 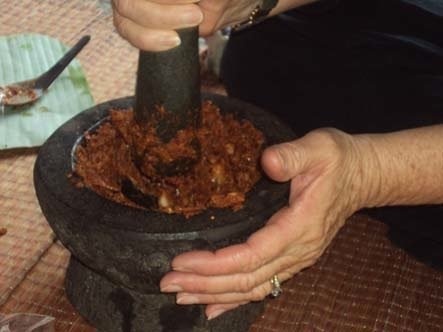 They also use a mortar and pestle to grind spices for curries. Kyle is expanding the program’s reach. Prem has begun offering intensive cooking classes aimed at adult travelers interested in experiencing real Thai cuisine. Participants explore Thai flavors with local chefs and make seasonal dishes using fresh organic ingredients such as Kaffir lime leaves, lemongrass, galangal, and sweet basil all harvested from the Prem Academy’s garden. Coconut, papaya, and bananas, are grown on site as well. 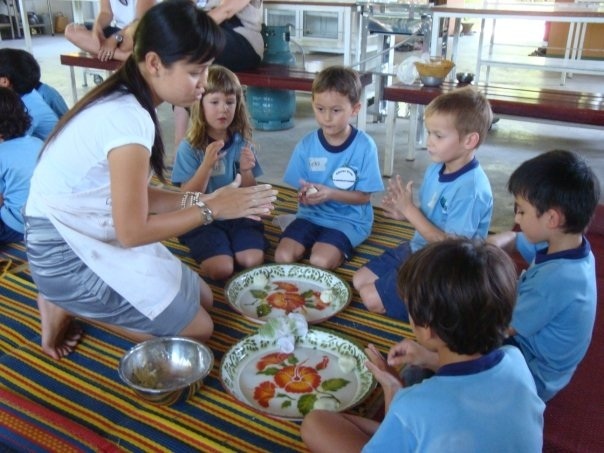 The program combines cooking and culture: Participants prepare alms trays, or offerings of food, to Buddhist monks at a nearby temple. 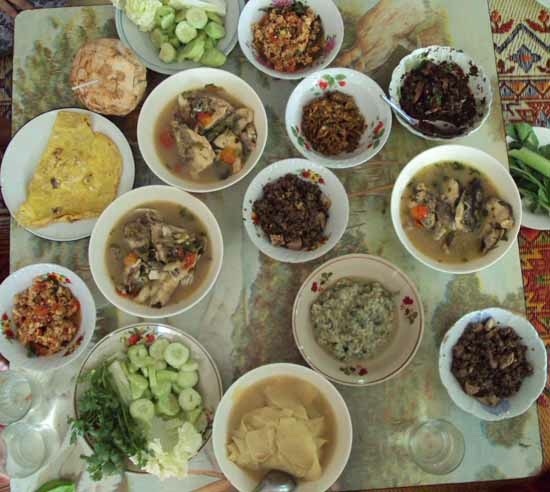 Longer courses offer the chance to cook in local homes and meet village elders. The classes are starting to find an audience. This month AFAR includes Prem in a round-up of cooking schools around the world. Last year Travel and Leisure featured a profile of the program by Karen Coates, who blogs beautifully on culinary travels at Rambling Spoon. Kyle looks forward to bringing back a repertoire of Thai recipes to try out on family and friends in the Bay Area. Below, she shares a simple noodle dish popular in northern Thailand. Prem chef teacher Khun Nid learned this recipe from her mother. It is considered a well-balanced, one dish meal. In keeping with Thai principles it has salty, sweet, spicy, crunchy, and soft tastes and textures. 1. Put the rice vermicelli in a mixing bowl and toss gently with the soy sauces to combine, being careful to not break up the noodle strands. 2. Sprinkle the sugar over the noodles and mix again. Set aside. 3. Heat 1 tablespoon oil in a wok over medium-low heat. Wait for 30 seconds and add the garlic. 4. Stir-fry garlic until golden and then add the noodles. Stir to mix until hot and fragrant. 5. Add the chili and stir to mix for about a minute. 6. Transfer to a serving plate. 7. Garnish the top of the noodles with green onion and cilantro. 1. Crack the egg into a small mixing bowl and beat it with a fork. 2. Add 1 tablespoon of the oil in a wok and heat over medium-low heat. 3. Spread and swirl the oil around the wok. Heat until hot, about 30 seconds. 4. Beat the egg vigorously and add to the hot oil. Swirl around into a thin sheet. 5. Carefully flip the egg over to cook other side when the bottom is slightly brown and the top congealed. 6. Transfer to a plate to cool once both sides are cooked. 7. Roll into a tight cylinder and slice across into thin strands. Set aside. 8. Add the rest of the oil to the wok, on medium-low heat. 9. Wait for a minute or so until the oil begins to smoke. 10. Add the tofu and deep-fry until crispy and golden, about 2 to 3 minutes. 11. Transfer to a plate lined with paper towels. 12. Surround the noodles with mounds of omelet strands, crispy tofu, bean sprouts, and dried chili powder and serve. Now, this is inspiring. Thank you for the view!! This is all absolutely fascinating. And the recipe is very doable, so thank you for that! Just love the concept of food having a set of ideals, such as “contrast, surprise, and balance,” and food as medicine, which I would interpret as “healing” or “feeding” in perhaps the larger sense of the word, to include “nurturing, caring or catering for, to fortify,” etc. It does give food a different meaning than how we sometimes relate to it in the States–very poetic. Also see this in Japanese food, the layering of flavors, and care in which it is prepared. These noodles sound yummy and will add them to my repertoire. Now don’t you want to go to Thailand? Oh, yah! Love how you riff on this piece, Nani, and I couldn’t agree more. And, yes, Thailand is on my travel list and the Prem Cooking Academy one of my stops when I get there. A lovely post. Thanks for sharing! I’ll be sure to look them up the next time I’m in Chiang Mai (hopefully in a few weeks – I’m hoping to get to the Northern part of the country again, but I don’t know for sure!). Glad you liked it, Stephanie. And would love a report back from the field if you make it to Northern Thailand. Love, love, love Thai food. I don’t cook it as often as I should, but this sounds like a great recipe to add to my repertoire. I would love to have the opportunity to go to Thailand! I found this post fascinating, especially the part about Thai children being as ignorant as American children regarding where food comes from. My pleasure, Kerry. 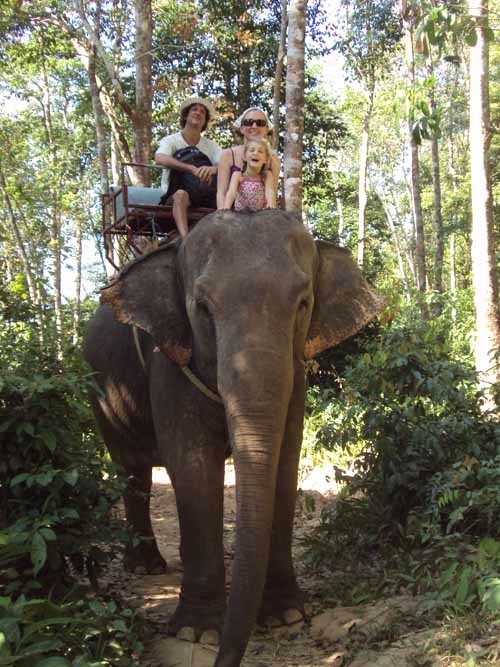 And perhaps your friends stopped by Prem on their short tour of Thailand. If not, you can all add it to your list for future visits. Fascinating post. Having visited Chiang Mai in October, I understand Kyle’s struggle with the heat and humidity. What a cooking adventure for Kyle and her family. I need to show my kids that picture of the children riding an elephant. They will be so jealous. (We all love elephants). I hope one day to get to Thailand and check this all out for myself! Fabulous post and what a wonderful opportunity for Kyle and her family. Where do I sign up? I love the sweet and spicy flavors of Thai food. I’m anxious to try out your recipe–I was surprised there was no Thai basil tucked in there (I love basil in all its varieties). And when she perfects her recipe for Khao Soy, please pass it along.